Vighna Ganapati is one among the 32 forms of Ganesha. This form of Ganesh is propitiated for removing all troubles and impediments. He removes all the obstacles. Ideal form of Ganesha to be worshipped by those searching for jobs. pashachakra swadanta sruni manjarikaa sharaduhai. 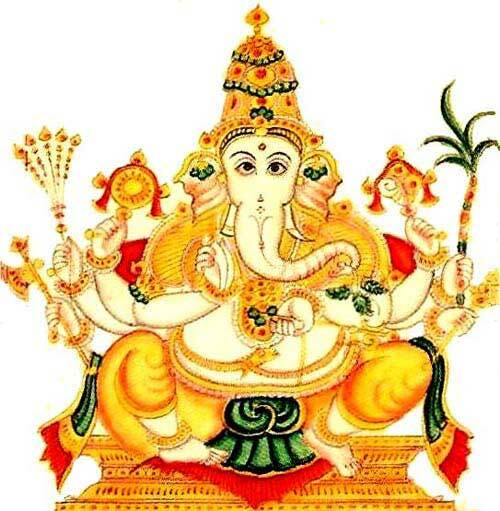 This form of Ganesha has eight hands. Vighna Ganapati is depicted as having golden color. He holds a conch, sugarcane, flower, axe, broken tusk, wheel, paddy and durva grass. Meditating upon Vighna Ganapati and offering prayers helps a person in removing obstacles and bad influences. It is believed that daily worship of this form of Ganesha brings in prosperity. This form is worshipped for success in exams and interviews. Along with devotion one should practice single-minded focus and approach all aspects of life with determination and positivity.